Henry Holt and Co. (BYR), 9780805095425, 176pp. 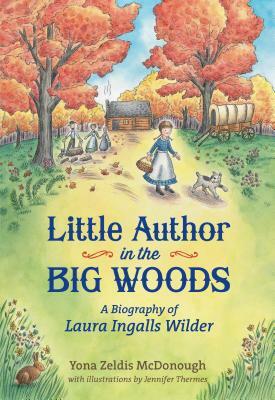 Many girls in elementary and middle school fall in love with the Little House books by Laura Ingalls Wilder. What they don't always realize is that Wilder's books are autobiographical. This narrative biography describes more of the details of the young Laura's real life as a young pioneer homesteading with her family on many adventurous journeys. This biography, complete with charming illustrations, points out the differences between the fictional series as well as the many similarities. It's a fascinating story of a much-celebrated writer. Yona Zeldis McDonough and her mother, Malcah Zeldis, have collaborated on several children’s books, including Anne Frank. McDonough lives in Brooklyn. Jennifer Thermes is the author and illustrator of When I Was Built and Sam Bennett's New Shoes, which was a Bank Street College Best Children's Book. Her books as illustrator include the middle-grade novel Maggie & Oliver and The Iciest, Diciest, Scariest Sled Ride Ever! Jennifer also creates illustrated maps for magazine and book publishing clients.